I get ridiculously excited when this box comes through my door! I am a huge fan of Crown and Glory and love all their products. The Glitterati box costs £20 including postage and packaging and this months is filled with around £85 worth of products!! A wonderful bargain if you ask me! 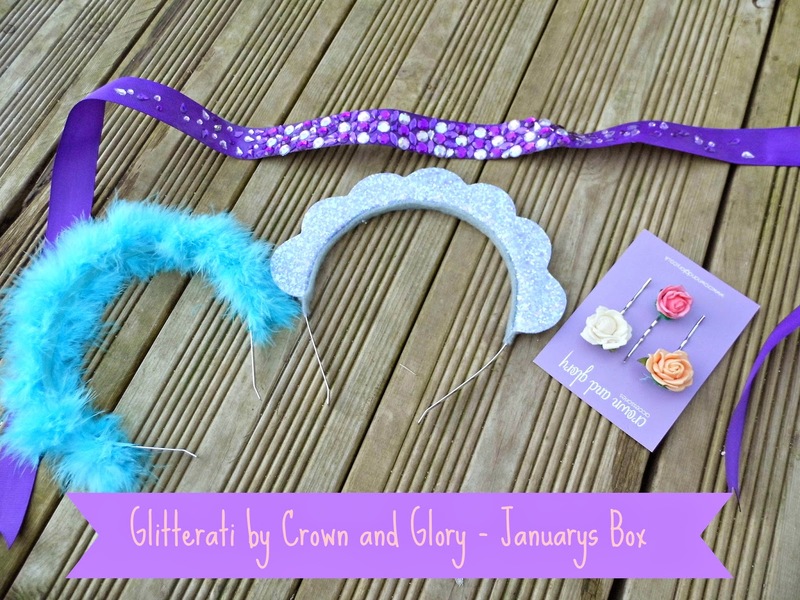 This month’s box didn’t fail to please, the first item I pulled out was the Glitter Scallop Crown in a gorgeous pastel purple colour. I think I am going to backcomb my hair for mass volume and have this crown as the finishing touch. Next up is the Marabel Feather Headband in bright blue. This is the only thing I pulled out of the box and thought ‘WTF? !’ I think it’s a little hideous! The glitter snap clips in orange are really pretty and are currently holding back my fringe. It’s at that awkward stage where it’s too long to be classed as a fringe but too short to sit nicely with rest of my hair. I really really need a haircut! Also being completely dippy this is the reason there is no photo of the clips as I completely forgot to take them out of my hair when I took the shots! Complete dippy moment! The jewelled ribbon gemstone band is in purple and so 70’s, I love it! I’m going to use it to sparkle up boring outfits. Finally there is the not a lotta Rosie bobby pins in white, peach and pink made from felt. They are too cute! Also as it’s my birthday this month, the lovely folk at Crown and Glory threw in a fab birthday card and an extra pressie for me! 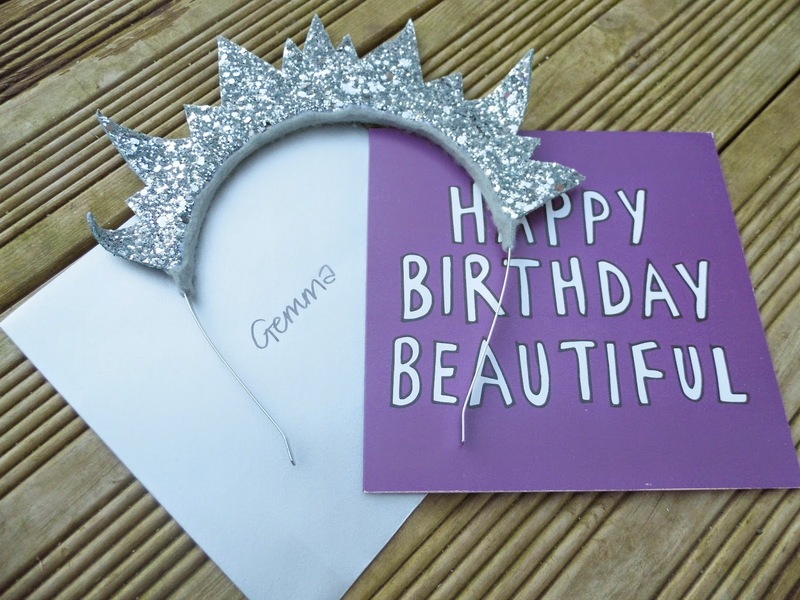 I received this amazing spikey silver glitter crown. It kind of reminds of the statue of liberty! Hehe! Its £35 if you were to buy it in the shop so I couldn’t believe it! Hi Gemma! Great review. Yes, I thought the same about the marabou feather one but at least yours is in my favourite colour-mine is baby pink!!!!!! I love the birthday one. You could dress up as a weeping angel in that!! Oooh and I posted about my snail mail from Janet!